Three weeks in and there are no signs of Kelly fitting in amongst the coffee-klatch community. Considering NBC almost killed its "Today" show franchise twice (does the axing of both Jane Pauley and Ann Curry simply because they were aging ring a bell? ), you might have assumed the network learned a lesson: Don’t mess with success. "Today" was like a well-oiled machine, with four seamless hours and a target audience—older women—who obviously forgave the network for both stars’ unnecessary exits. It was performing well against chief rival "Good Morning America," and life at "Today" seemed to be pretty darn good. As the former "golden girl" at Fox News, Megyn Kelly could do no wrong...at least it seemed. Her show, "The Kelly Files," had been the second highest rated cable program in the cable news net (behind "The O’Reilly Factor") since 2013. She wrote a best-selling memoir, "Settle for More." She repeatedly sparred with then president-elect Donald Trump, never backing down and gaining a ton of publicity as a result. She landed her first primetime special on Fox (with Donald Trump, pre-presidency, one of the interviewees). And there was Kelly, front and center, defending the women who accused former Fox News chairman Roger Aisles of sexual misconduct. So, when it came time for Kelly to renegotiate her contact (timing is everything), a number of outlets expressed interest. Included was Fox News, even though Kelly was busy trashing her then-current home. NBC won the bidding war (for a reported $17.5 million per year for the next three years; a grand total of $51.5 million). But there were two burning questions looming in this massive investment. Where exactly does the network position Kelly? And how do they rebrand her outside of politics as the new "girl next door"? NBC, unfortunately, seemed to have no clue. Nor did the network really even seem to need her. To ease her into her new role, step one was a primetime newsmagazine, "Sunday Night with Megyn Kelly," where the Kelly we knew could sit down with someone like Russian president Vladimir Putin and discuss the political climate. But debuting in the summer when TV viewership levels are down and airing opposite CBS mainstay "60 Minutes" was a suicide mission. Viewer interest was nil. 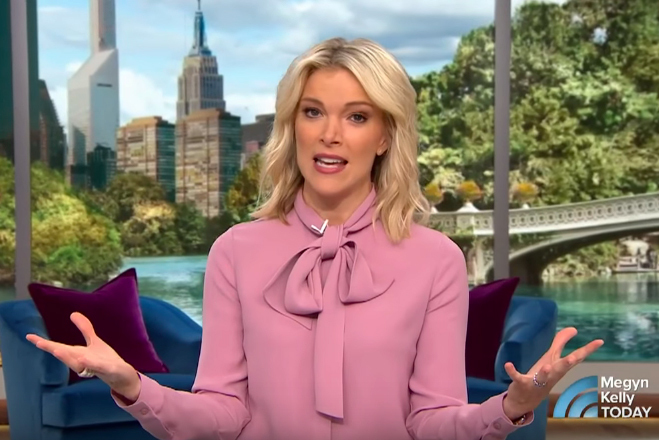 Now, of course, there is a new girl in town, a kinder, softer—and what NBC was hoping would be a more relatable—version of Megyn Kelly, as host of the 9 a.m. ET weekday morning hour "Megyn Kelly Today." But, exchanging politics for banter about her own life ("I have my Mom in the audience," Kelly enthused in the opening telecast) is an insincere fit, as was sitting down for some fun and frolic with the cast of "Will & Grace" and Jane Fonda and Robert Redford, to name a few, in these early weeks. In search of an identity, week three of "Megyn Kelly Today" opened on a more familiar note for Kelly, as she discussed the firing of film producer and studio executive Harvey Weinstein amid accusations of sexual harassment followed by a sit-down with Weinstein accuser Lauren Sivan. But seguing into Savannah Guthrie and Allison Oppenheim, there to promote their new kids book "The Princess Wears Pants," put Kelly outside of her comfort zone, which led into a segment featuring five under-40 breast cancer survivors and a demonstration for women on how to protect themselves. It was a hodgepodge of sorts, hosted by a woman who seems to have no inherent connection to the audience or to the viewer. Had NBC utilized Kelly, perhaps, to beef up its line-up on MSNBC or CNBC, the more caustic and politically charged Kelly we were accustomed to might have been an appropriate fit. In daytime talk, particularly targeting an older female audience, the secret to success is the connection. These women are not going to spend an hour each morning with a host they don’t really know or trust (hence the reported double-digit rating losses for "Megyn Kelly Today" in total viewers and adults 25-54 in week one, versus the same week a year ago when Al Roker, Tamron Hall and Billy Bush were hosting the hour). Ellen DeGeneres has that connection, as do Kelly Ripa, Rachael Ray, Wendy Williams, Robin Roberts and Kathie Lee Gifford and Hoda Kotb, to name a few. And then there was the "Queen," Oprah Winfrey, who simply possessed that common feel-good element. Three weeks in and there are no signs of Kelly fitting in amongst the coffee-klatch community. "The truth is, I’m kind of done with politics for now," Kelly said in the opening installment of her latest show. "It’s everywhere and it’s gotten so dark." But politics was Kelly’s connection. Without it, she simply feels out of place. And if the ratings for her show continue to stumble, my prediction is Kelly will end up on one of NBC’s cable news outlets reporting on what she knows—politics—at least until her contract ends. Had NBC done its homework, or at least watched Kelly’s primetime special on Fox back in May 2016, it would have realized Kelly is the absolute wrong fit on "Today" (and maybe on the network in general). Who's to blame for summer's dismal TV ratings?